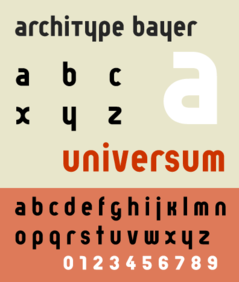 Something important to know about Herbert Bayer is that he designed the “Universal” or “Bayer Universal” typeface in 1925. This sans serif typeface consists of both upper and lowercase letters in a single character set. On a more interesting note, Herbert Bayer was the art director of Vogue magazine in Berlin, Germany. He once designed a brochure for the Deutschland Ausstellung, where life in the Third Reich as well as Adolf Hitler were celebrated. Then in 1937 His works were then placed in the Nazi propaganda exhibition called “Degenerate Art”. The following year Bayer left Germany and moved to New York City.